Matt is an artist, designer and maker based in Norwich, in the east of England. A graduate of Bretton Hall arts college of the University of Leeds and Norwich School of Art and Design (now Norwich University of the Arts) he has spent the last decade fulfilling commissions, running arts projects and facilitating creative workshops. An eclectic skills base encompassing theatre design, puppetry, sculpture, animation, illustration and performance has lead to delivering projects and providing creative solutions to a diverse range of clients both in the UK and internationally. 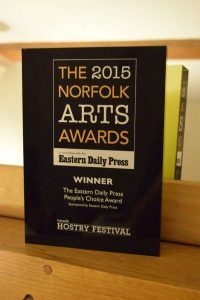 In 2015 he was awarded the EDP People’s Choice in the Norfolk Arts Awards.